Stick with us at Kosher Tape Plus! 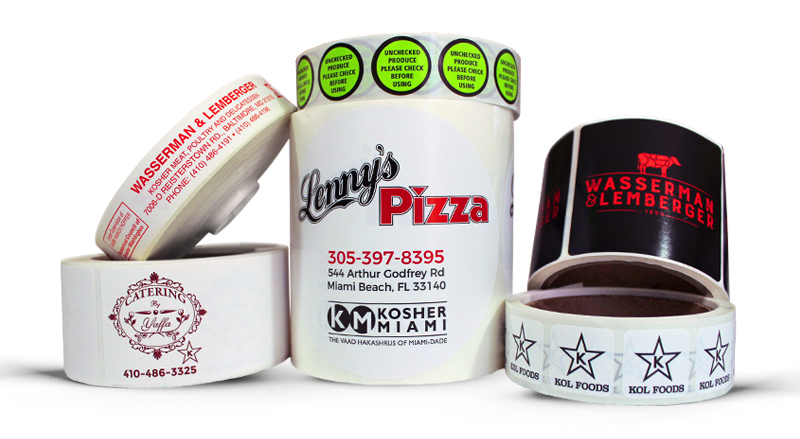 Kosher Tape plus has been a well know supplier of custom printed tape. In addition to the tremendous variety of tapes that we produce, we also offer many sticker options for sealing and branding your packages. Choose your size, shape, material and color to create a great sticker that keeps your product sealed and certified kosher while showing off your brand. Stickers are an excellent option for restaurants that have clean, simple packaging and want something that will take up minimal space and complement their design. Our stickers all have strong adhesive properties, so just one can go a long way! Finally, stickers are the perfect choice for busy, fast-paced restaurants since they can be peeled and applied quickly. Like tape, stickers can keep your products kosher while in transit. We’ll print your company logo, contact information and the symbol of the certifying kosher organization onto the sticker type you choose. Use them to seal paper bags, clamshells, thin cardboard containers and more! Give your customers peace of mind and insure that their food stays kosher from the time it’s packaged to the time they receive it. With such a large selection of shapes and sizes, we’re confident that we carry your perfect sticker. Some of our most popular materials include gloss and white gloss. We also offer freezer stickers and removable label stickers to mark chometz areas during Passover. We have heat-friendly materials available, too – just let us know your requirements! So many benefits come with using stickers. 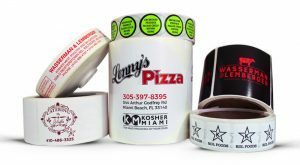 Not only do your kosher products stay sealed, but you also advertise your company in a very noticeable and effective way. If you would like to learn more about our sticker options and discuss your custom requirements, please give us a call at 410.585.1513 or shoot us an email at info@koshertape.com.